Zuletzt geändert von David am 25.08.12, 11:26, insgesamt 5-mal geändert. Besonderheit: Toolbar abwählen bei der Installation ! Converted Project From NetBeans IDE And MinGW GCC To Microsoft Visual C++ 2010 And Windows SDK 7.1. Removed OpenASIO (This Was Only Required For GCC To Work With ASIO). Added DirectSound Output Support (This Is Enabled By Default For New Installations). Fixed A Program Hang Which Sometimes Occurred When Loading A Project If A Project Is Already Open. v4.0.4 Fixed Race Conditions Causing Intermittent Crashes Reading And Writing Control Message Buffers. Fixed Main ToolBar Master Volume ToolTip Display To Read Correct Level In Decibels. Master Volume Slider In Main ToolBar Now Sets Volume To Complete Silence When Moved Completely To The Left. Added A New Sample DarkWave Project Called 'RaveTech.dwp'. Recompiled With Visual C++ 2010 Express Service Pack 1. 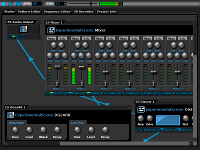 DarkWave Studio and VST PlugIns are now released under a freeware license. BetterInstaller has been removed from the DarkWave Studio setup program. v. 4.3.8 - Vorsicht bei der Installation, das geht wild hin und her. Seither u.a. Removed Somoto BetterInstaller Download Client. Fixed A Plague Of Timing Bugs Affecting ES Arpeggiator. Fixed A Bug In The Audio Options Dialog. When Resizing The Window The Drop List Boxes Would Not Redraw. Upgraded Project To Visual Studio 2013 Express. ASIO Support Disabled By Default. Fixed A Bug In The Audio Output Driver Drop List Causing A Selection To Be Made (Silent Driver) When Not Selecting An Item From The List. Changed BetterInstaller Integration With Installer To No Longer Require Separate Download Of Setup Package. Installation Will Now Work On Computers Not Connected To The Internet. Fixed A Bug With The 8-Bit Audio Output Code Which Caused Severe Distortion. Removed OpenCandy. Installer Does Not Require Separate Download Of Installation Files.